Very little is known about Major General Michael Calhoun’s childhood beyond the fact that he was born in 1954. After Graduating from Florida A&M University with a degree in Pharmacy in May, 1977, Calhoun enlisted in the Florida ArmyNational Guard in August of that year. Initially he served for six years and then took a six-year break of service and returned to the Florida Army National Guard only after being offered a direct appointment to first lieutenant in the Medical Service Corps in 1989. Shortly after his reinstatement, Calhoun served as Chief of Pharmacy Services, 131st Mobile Army Surgical Hospital (MASH); Executive Officer, 131st MASH; Logistics Officer, 50th Area Support Group (ASG); Director, Host Nations Support, 50th ASG, and Director, Support Operations 50th ASG. Calhoun deployed with the 50th ASG in 2003 to Kuwait where he served as Director of Host Nations support during Operation Iraqi Freedom. Two years later and back in the United States, he was Deputy Commander of the Florida National Guard Task Force sent to the Mississippi Gulf Coast in the aftermath of Hurricane Katrina. Later he earned his Master’s in Strategic Studies from the U.S. Army War College in Carlisle, Pennsylvania. In 2011 Calhoun became the first Brigadier General in the Florida National Guard. In his years since his initial enlistment in 1977 in the Florida National Guard, Calhoun’s roles evolved from providing first aid to newly arriving Cubans in Florida during the 1980 Mariel Boatlift, to spending a year deployed with a combat support medical unit in Kuwait after the American invasion of Iraq in 2003. Calhoun’s distinguished service has garnered for him many awards. He is the recipient of the Legion of Merit Award, the Bronze Star Medal, the Humanitarian Service Medal, the Florida Cross, the Florida Distinguished Service Medal, the AlabamaCommendation Medal, and the Mississippi State Emergency Medal for his work in that state in the aftermath of Hurricane Katrina. He was also the Army National Guard recipient of the Department of Defense’s African American History Month Recognition Award for 2008, for his contributions to the Global War on Terrorism he was a recipient of the Ancient Order of Saint Barbara. 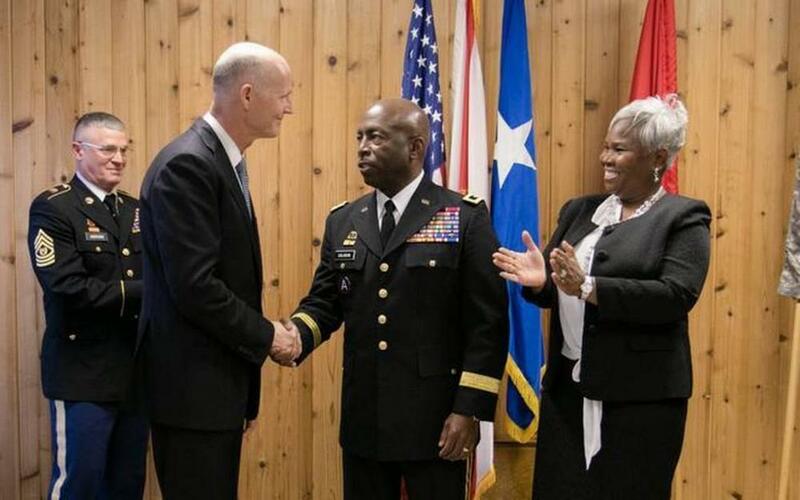 In 2015, Governor Rick Scott of Florida appointed Michael Calhoun the Adjutant General of Florida. As the Adjutant General, he is the senior military adviser to the Governor and is responsible for the overall management, readiness, and mobilization of both U.S. Army and U.S. Air Force elements of the Florida National Guard. He is the commander of nearly 12,000 Florida Army and Air National Guard troops. Major General Michael Calhoun is the first African American to ever hold this position in the state of Florida. General Calhoun resides in St. Augustine, Florida with his wife Sophia and their only son, Evan. “Major General Michael Calhoun.” U.S. National Guard Biographies, National Guard, 6 Jan. 2017, http://www.nationalguard.mil/portals/31/Features/ngbgomo/bio/2/2425.html; “The Adjutant General of Florida.” The Adjutant General of Florida, Florida National Guard, http://fl.ng.mil/leadership/Pages/The-Adjutant-General-of-Florida.aspx; Carol Rosenberg, “From Private to General: Florida National Guard getting a new leader,” Miami Herald, March 27, 2015, http://www.miamiherald.com/news/state/florida/article16520174.html.